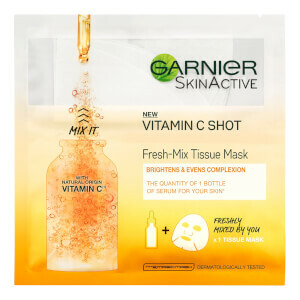 Create a soft, bouncy skin texture with the Garnier Fresh-Mix Face Sheet Mask Shot with Hyaluronic Acid, a DIY face mask that you can mix yourself. In the first section is a dry Algae tissue mask, and in the other a rich, hydrating serum. When combined, they create a gel cushion mask that encourages the absorption of ingredients into skin, replenishing vital moisture and restoring a silky, supple skin texture. Hyaluronic Acid works to plump out the appearance of fine lines whilst creating a radiant glow, leaving behind bright, firm and youthful results. 967408 02, Aqua / Water, Glycerin, Propanediol, Betaine, PEG-40 Hydrogenated Castor Oil, Sodium Citrate, Sodium Hyaluronate, Algin, Ascorbyl Glucoside, Hydroxyacetophenone, Hydroxyethylcellulose, Citric Acid, CI 19140 / Yellow 5, Parfum / Fragrance, (F.I.L. C222269/1).